When was the last time you treated yourself to some insanely clever travel accessories? A great suitcase is a must, of course, but what about a jacket that holds as much as your carry-on... or a mini personal humidifier? Check out these 11 awesome -- albeit totally extraneous -- gadgets you didn’t know you needed. For most of us, coffee is an important part of the day -- and that shouldn’t change when you go on a trip. 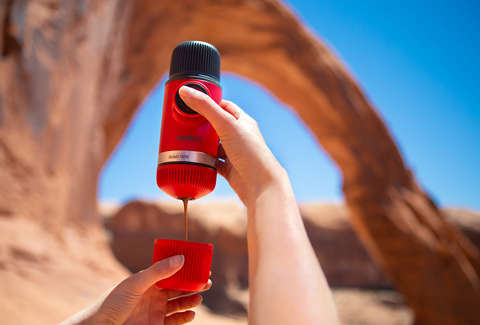 That’s why this tiny, super-portable espresso maker from Wacaco is the perfect travel companion. The Nanopresso is just $65, weighs less than a pound, and only requires water and ground coffee for the perfect cup. Whether you’re going camping, staying at an Airbnb and just want your own blend, or the airplane joe isn’t strong enough for you, now you can bring your own with this handy gadget. Pair it with your Drink-Caddy and say goodbye to airport prices. One of the most annoying things about traveling is, no doubt, packing. Out from your closet comes a pristine, wrinkle-free shirt and into your suitcase it goes -- only to get completely creased by the time you arrive at your destination. If you’re traveling for business and don’t have time between busy meetings to iron a shirt, this clever $25 shirt case from PackTidy is for you. Using the included folding board, simply fold your shirt and tie and tuck them in for a safe flight. Customers say for flying, driving, and even biking, their shirts stayed wrinkle-free. Sometimes you need to travel light -- we get that. Whether it’s a big hiking trip or you just don’t want to carry a bag through TSA, sometimes it’s better to ditch the backpack. That’s where this epic Baubax jacket comes in. Starting at just $139 for the sweatshirt or windbreaker versions (but why not drop the extra $20 for the bomber? ), this travel jacket has a designated pocket for nearly every item you’d want to bring. It’s got a phone pocket, a neck pillow holder, built-in gloves, and can hold a full water bottle -- and that’s just the beginning. With 25 features, you’ve got to admit: It’s a helluva lot more useful than your that hoodie you stole from your ex-boyfriend. Whether you’re 6’4” or 5’2”, long plane rides make your legs sore. (Yes, even short people need to stretch their limbs.) Instead of walking off the cramps when you land, bring along this portable airplane footrest from Sleepy Ride. Simply clip the cute little hammock around the tray table or chair in front of you and lie back. Just $20 can make long rides totally bearable, and will keep your toes from hitting the cold floor. See, you don’t actually need first class to feel like you’re in the lap of luxury. Being exposed to high altitudes can dry you right out. That’s why you might feel dehydrated or experience dry skin after a long flight -- and why you should always carry lip balm while drinking tons of water. Psh, let’s take it one step further. This tiny-but-mighty personal humidifier from Fancii uses an individual water bottle to provide moisture during (or after) a long flight. 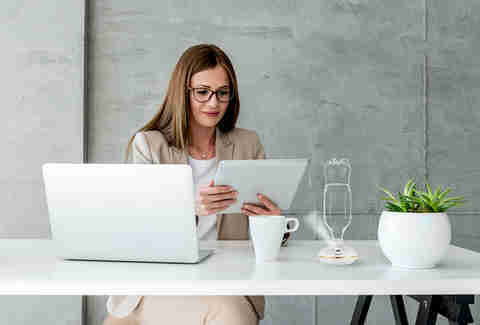 Like any good travel gadget, it’s less than four pounds, fits in your purse or backpack, and can even run on AA batteries. At just $25, we have a feeling you won’t be going anywhere without it. So you’re having a beach picnic and all of a sudden... the hummus tastes kind of gritty. And actually, it’s not just the hummus but the salsa, too. That pesky sand. We love it, just not all over our stuff. The CGear Sand-Free Mat solves that problem completely. Starting at $44.50, this mat gets rid of sand and dirt by using a dual layer of synthetic meshing. The sand falls right through and becomes trapped underneath, so you can have a perfect, mess-free beach picnic. And if you prefer camping, guess what has a pretty similar texture to sand? That’s correct: dirt. Man, what are we gonna do about getting around these gigantic airports? The moving walkway only gets you so far and then what? You have to walk the rest of the way to your gate. No, thank you. Instead, you need this luggage that turns into a way for you to zoom through the terminal. 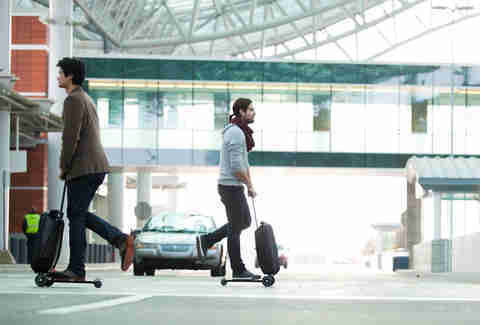 Made by Micro Kickboard, this TSA-approved carry-on looks like any other luggage, but has a pop-out kickstand and wheel so you can zip to your destination. And being this cool doesn’t come cheap; the Micro Luggage will run you $299 -- but save you tons of time and stress. Delayed flights, packed trains -- sometimes the worst part of traveling in the standing around. If only you had, let’s say… a wearable chair so you’d have a seat in crowded bus stations, airports, etc. Behold the Lex: Bionic Chair, an exoskeleton-style chair that corrects your posture while keeping you comfy. Lex automatically aligns you into a 120-degree body-thigh sitting posture, so traveling with this guy means less stress on your back. Of course, tech like this comes at a price. Lex is just out of the Kickstarter phase now and will be available soon. If you need to pack light, that means you’ll need one important item: the Scrubba Wash Bag. This five-ounce portable washing machine lets you keep your clothes clean wherever you go. Simply unfold the bag, load it up with an item or two, add water, a drop of detergent, and massage your clothing until it no longer smells like you just went on a three-hour hike. The flexible washboard will get your items way cleaner than dipping it in the lake. At $50, the Scrubba Wash Bag might seem pricey, but considering it’s reusable and durable -- that’s an investment. Holding your beverage in your hand is so yesterday. When you need a caffeine kick for your 5:20am flight but need to rush through the terminal, the Drink-Caddy cup holder will be your best friend. This $17 device from Freehand Travel attaches to the handles of your luggage, leaving your… hands free (oh, we get it) to hold your passport, boarding pass, and whatever else you may need. When you’re done, just fold it up and put it in your luggage until your next on-the-go drink.